On request we can go onto the Aubrac plateau, the Mont Lozère or the Cévennes... or the Causses as soon as the first snowflakes fall. 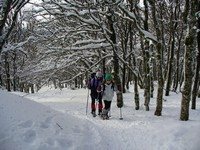 Alone, with family or in a group, Evasion offers diverse facets of the use of snow shoes. In a magnificent natrual setting, this is the occasion to introduce yourself to orientation, "nivologie" (the study of snow in all its forms), and the use of avalanche transceivers. For kids: build igloos and games. It is also a time to learn to recognise the tracks and other clues of the presence of animals. The activity is open as soon as there is snow, between December and March. Come with the required equipment.